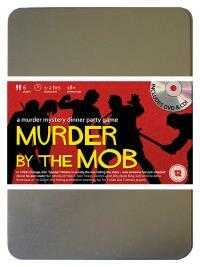 You've been invited to play the role of SAM ANNELLA in Murder by the Mob. Chicago in the late 1920’s is overrun by the mob, most of whom have been invited to "Spudsy" Malone’s party. However, when the Don welcomed everyone to celebrate the invention of his new potato alcohol drink, he wasn’t expecting any of them to "do him a favour" and shoot him in the chest. Join with us to find out who whacked the big potato! Fat Sam’s restaurant is famous for three things: good food, good drink, and goodfellas. With Sinatra on the jukebox, your place is the mob’s home away from home, and you like to think you’re part of the family. At least with them eating there, you know they’re not going to burn the place down! And, hey, what’s a few bullet holes between friends?